"What's so good about these new commercials is that they give me a chance to develop a new personality, a new character for each one, instead of being myself. God knows who that is, anyway." The Unknown Peter Sellers is a biographical documentary about the great British comedian and actor, produced for television and originally aired in April 2000. The program covers Sellers' career from the early 1950's through his death in 1980, featuring interviews with his distinguished colleagues and fans, with many rare film and television clips. While similar in style to the popular A&E and E! 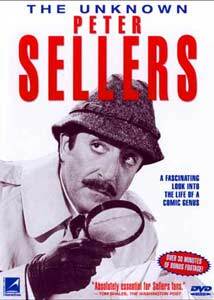 cable network biography programs, The Unknown Peter Sellers goes a step further. Most TV documentaries contain little new information for those familiar with their subjects, but this production lives up to its billing, digging up genuinely rare clips from Sellers' early films, television work and unreleased features. While the Pink Panther films and Being There are prominently featured, the program devotes just as much time to Penny Points to Paradise (1951), Sellers' debut feature unseen since its original theatrical release; The Goon Show, the classically chaotic radio comedy program which influenced the Monty Python team later on; the pioneering TV program A Show Named Fred; and The Running, Jumping and Standing Still Film, the Richard Lester/Peter Sellers short which was nominated for the Academy Award and led to Lester's work with the Beatles. Many of Sellers' lesser-known films and flops are also discussed, almost always with clips, including The Mouse That Roared, Never Let Go (Sellers' only serious "bad guy" role), the unreleased Roman Polanski feature A Day at the Beach, the Rod Serling television movie A Carol for Another Christmas, and an abandoned Sellers/Billy Wilder effort. The program also features new interviews with Sellers' colleagues and admirers including Sir Harry Secombe, Michael Palin, Shirley MacLaine, Sir David Frost and others, fleshing out a portrait of the notoriously shy Sellers, who was never comfortable "being himself" on camera. If there's anything disappointing about The Unknown Peter Sellers, it's that the breadth and depth of its approach merits more than the program's 60-minute running time; one gets the impression that the producers' research could easily have filled two hours. Still, the program is chock-full of fascinating, rare footage, assembled coherently with well-written narration and biographical material that raises it above the level of a simple compilation. A must-see for Sellers fans, and fascinating viewing for anyone with an interest in the actor's career or the development of "British comedy" as we know it today. Image Transfer Review: The Unknown Peter Sellers is presented in its original 1.33:1 made-for-television full-frame aspect ratio. Film clips used in the program are often panned-and-scanned, though much of the older material is in Academy ratio. The show's broadcast-videotape origins are apparent—scan-line and digital editing artifacts (on still images) are apparent, and all film clips have undergone 3:2 pulldown for television. Footage is drawn from old television kinescopes, 16mm film, videotape and theatrical features of widely varying quality; the image is generally soft but clean, and the transfer seems solid enough given the source. Typical television documentary material, but perfectly watchable. Audio Transfer Review: Fox Lorber's The Unknown Peter Sellers is presented with a Dolby Digital 2.0 monophonic soundtrack, ProLogic-decoded to the center speaker. All of the archival material and new interview footage are monophonic, as I suspect most of Sellers' films were, so there doesn't seem to be anything lost in the translation. The sound quality is quite good considering the age and condition of some of the source materials (including a wax-cut audio recording of Sellers' first television appearance), though it won't give anyone's system a workout. Sellers gives a rare interview, generously giving us nearly twenty-two minutes "behind the curtain" as he discusses his personal shyness, his characters, his career, and his colleagues. Nervous at first, the actor slowly warms up and punctuates his honest thoughts with some hilarious improvised performances. A tremendously valuable addition. Three British television commercials filmed by Sellers very near the end of his life, in which he creates a new character named Monty Casino, a trenchcoated Cockney con man bent on parting various fools from their money. These rarely seen spots are quite funny and play out as mini-movies, with fine work from Sellers. Three US tv spots for Trans-World Airlines, filmed during a low point in Sellers' career when he needed the money. Each spot features a different character meant to promote TWA's intercontinental service, with Sellers playing an uppercrust British gentleman, a sensual Italian lover and a frugal Scotsman. There's obviously some ethnic stereotyping here, but the spots are humorous enough, though not as sharp as the Barclay's commercials. Apparently an internal TWA production, in which Sellers discusses his participation in the company's television campaign, improvising and riffing a bit with some ribald humor that would not have passed television muster at the time. Sellers is always "on" in this brief short, which makes it more entertaining than it otherwise might have been, but also deprives us of any candid footage of the man at work. A comprehensive list of Sellers' feature films from 1951 to 1980. Two text screens of credits, one for the program itself and one for the DVD. The Unknown Peter Sellers is an informative, broad-ranging documentary about the life and times of one of Britain's most accomplished comic actors, featuring extensive, genuinely rare Sellers footage. Fox Lorber's DVD is competently presented with substantial supplements; it's a well-executed portrait of a fascinating personality - or personalities. Recommended.